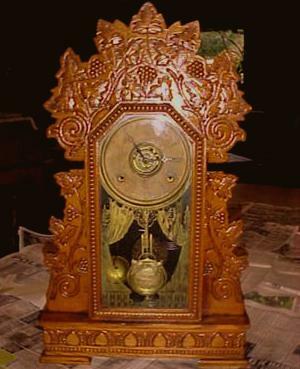 Recently, I viewed an Antique Road Show where a guy had a long skinny Gilbert Clock. 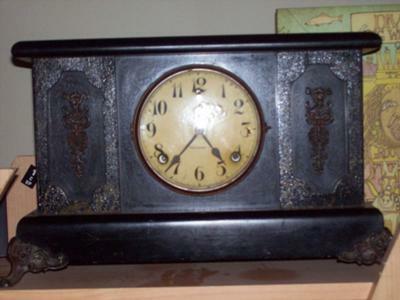 The clock was 2 feet long, round on top where the face and hands go, skinny middle with flower design on wood and small sqare bottom with glass picture front. You can imagine how shocked I was to be in the Goodwill store watching several people picking up a beautiful Gilbert clock and discarding it like trash! So I grabbed it. I am not a collector, but am impressed by this wonderfull piece of art. My clock is 2 feet long,7 1/2 inches wide. the inside of the face looks to be made of silver cardboard, with gold and black numbers with the Gilbert name just under the hands. On the bottom of the face it is stamped made in the u.s.a. On top there is a metal American eagle figure. The neck has what appears to be hand painted roses,that are in good condition, measuring 5in. in length. The square bottom has a glass mounted front with a bridge and countryside picture. The backside is engraved with the letters usa and the number 3707. The clock is in great condition with minimal wear and tear. The clock mechanism is wound tight and not working at this time. 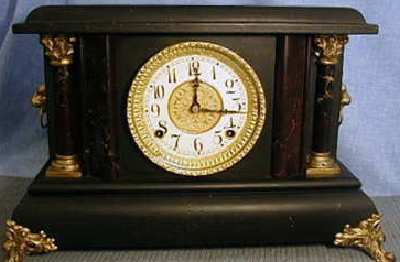 I have a painted mantel clock that says "Gilbert 1807" on the face and "Made by Gilbert at Winsted, Conn., USA. I know the Gilbert Clock Company was not founded until several years later. What could this be? There is no label on the inside, but you can see where one was. The number stamped on the bottom of the clock is 6759 and another barely readable stamp that says, Made in USA. Anybody out there have a clue as to the authenticity and/or history? I have a Wm.L.Gilbert Clock. General No.131. How old is it and what's its value? I have recently acquired a Gilbert mantel clock that I know nothing about. It stands 12" tall, 20" wide and 5" deep. On the face just under the 12 is a small hole under the hole are the capitals SF that have been stamped into the face. Inside on the movement it has Gilbert stamped, the number 24 and the letter G in a diamond. On the bottom of the movement is a single curly wire for the chime. Unfortunately there is no weight for the pendulum, but does work if operated gently by hand. The case appears to be of oak.Perhaps somebody knows a bit about this clock or even the weight of weight, I could then make one to suit. My parents gave me a clock that I was wanting to find out some information on. 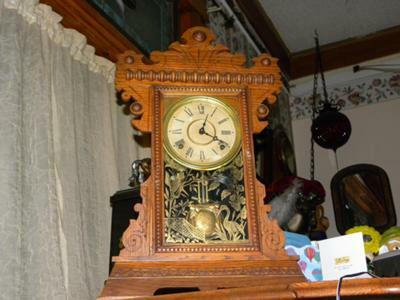 It is a mantel clock in good condition it just doesn't run. 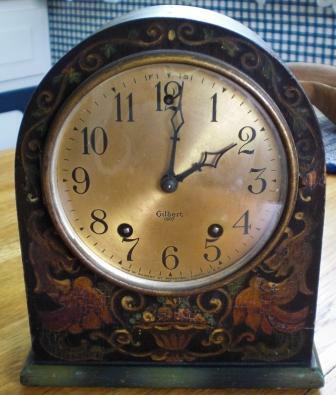 On the face of the clock it says: Made by William L. Gilbert Clock Co Winsted Conn. USA. On the bottom it has the number 2059 engraved into the wood. And the words NORMANDY Chime stamped on it. Would it be a wise investment to get repairs done on it? I bought a cute little clock at a garage sale. I know next-to-nothing about clocks, but I was intrigued because this one actually keeps time, and has a separate little dial for the second hand. It stands 4.5 inches tall to the top of the flower, and has twirling 'vines' for handles on the side. The dial is white and the numerals are black. On the back is a knob that sets "set hands," a key to wind it up, a fast/slow lever. It says: Patented Sept 2, 02, Jan----- can 't read, Nov. ___ 08, ____ _____ 09. It weighs 1 pound, 1.5 ounces. Oh, there is a "G" in a diamond on the back, near the bottom. Thanks for any info on this clock! 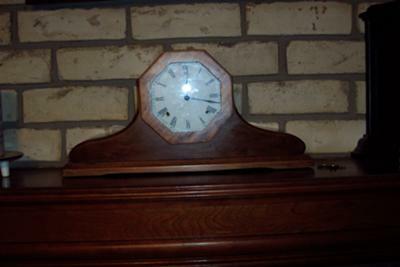 1906 Mantle clock from Wm. L. Gilbert Clock Co. I just recently inherited a 1906 Mantle clock made by the WM L. Gilbert Clock Co. from my Great Grandmother. Now I have no experience in caring for mechanical movement clocks such as this one, so I was wondering if anyone could give me some advice on how to care for it and how much it might cost me to have the clock restored. As of right now all of the brass fittings on the clock are very tarnished. The red marbling on the 2 pillars and the areas by the clock face is covered by what I think is black paint. The clock is not working at all but from the peek I took inside, all the parts appear to be there. I know the clock is going to need a really good cleaning before it runs I just don't have a clue how much that would cost me. Any information about this clock would be really welcomed as I'm kinda clueless about this great timepiece. I hope to have it completely restored some day so I can pass this beautiful time peace on to my children when I have a family of my own. This clock has been in the house my parents bought in 1947, so we know little about its age or value. I took plenty of pictures of it, so I will let the pictures be the description. Can anyone tell me about this clock? It is not currently working, and I would like to know where I can get it fixed. 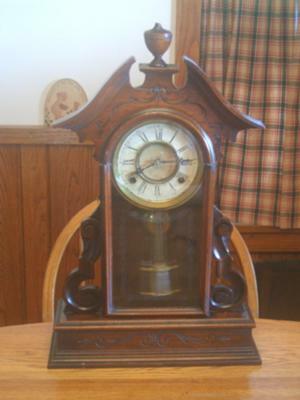 Parlor clock, 24" high, base 15", star-like leaf pattern top center, smaller leaf patterns on either side, top. My Dear Mother, whom I lost in October 2008, used to own a thrift store. 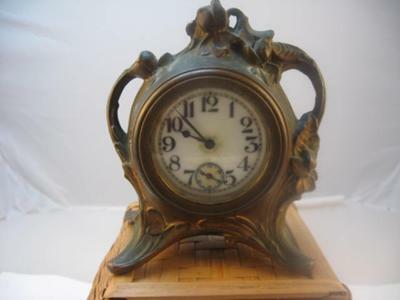 One of the many treasures that she came across is a Gilbert blue porcelain mantle clock with a floral design, gilt details, which she (we girls always ended up with Mom's best) bestowed upon me several years back. 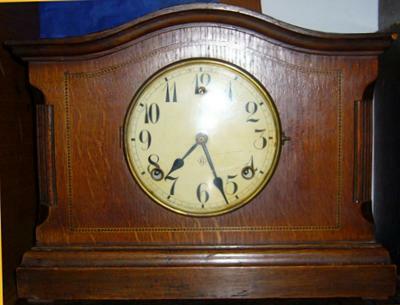 The clock is in wonderful condition, I had it cleaned and restored to working order by a local expert. It is dated 1904, with the number 244 on the back. I would love to know the history and value of this gift from Mom. Found stamped on movement:Wm. L. Gilbert Winsted,Conn. USA Patun 111870 6 1/2, not sure about Patun but that is what it looks like. I just bought this Gilbert mantle clock which chimes on the half and on the hour. It has an octagon face, the Gilbert diamond shaped label on the back door, and the number 25 stamped on the works. There is not the name Gilbert on the face. I bought this clock from a car boot sale for £45 and know nothing about it other than what it says on the face "Wm L Gilbert Clock Co., Winsted, Conn USA". I then paid a professional clock restorer £45 to have it cleaned inside and to get it working again as it was full of fluff and old oil and not ticking properly. It now works beautifully and keeps perfect time. It chimes on the half hour and on the hour and is surprisingly loud! This is the first time I have owned this type of clock and I love it to bits. Could anyone give me some information about it - approximately how old it is, how many of them might have been made, etc? William L Gilbert Champion "O"
Passed down through the family. Owned by the northern Ireland branch of the family, and that is really all I know. Good condition, clean label and dial runs well and chimes 1/4s plus hours. Well ..it has been handed down at least twice that we know of and now we have it ..so I guess it is 3 times.We are wondering when it was made and what the worth of it might be. We don't want to sell it ..just wondering ..it is in good working order and we love the sound of it chiming when the hour and the half hour comes about. Any help would be greatly appreciated. Thank you and have a great day. I inherited a clock that belonged to my grandfather. It was given to him as a wedding present after his family immigrated to the United States from Norway in 1845. 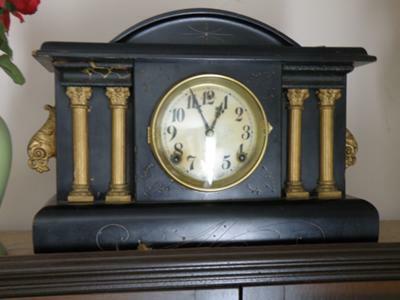 It is a wooden mantel clock that has a pendulum ball and key. The back cover says Gilbert 1807. Towards the bottom it says William L. Gilbert Clock Company Winsted Conn. U.S.A.
Want to know more about this clock. I am thinking on taking up repair as a hobby. Would this be a good "first patient" or is it horribly complex? Number on bottom of case is 2806, and I can barely make out the "Normandy Chimes" next to that. Back of movement has G in a diamond and there is also a number 30, is that possibly the year this was made? Case will need some refinishing and it doesn't run. Before I start I want to say that I have always loved clocks, but I don't know anything about them. And I'm looking for any information anyone can give me on my clock. This is a very precious heirloom but I'm wondering how careful I should be with it. What I mean is I'm wondering how much it's worth. My clock was recently passed down to me by my mother. The clock has been in our family for some time. It originally belonged to my great grandfather. There is a date of 12-11-31 on the back and the face says Gilbert on it. The clock is wood and either has a very dark stain on it or is painted black. Thanks for your help!!! 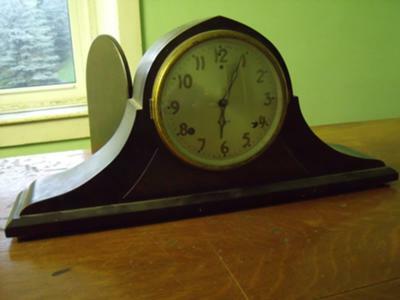 I do know that this is a kitchen clock made by the William L. Gilbert Clock Co. in what was formally called Winsted Connecticut. I purchased this clock at an estate sale in Crystal Mn. June 2009 for what I felt was a real bargain at $40.00. I do not know the year or what the real value might be, Also I would like to know if this is an 8-Day clock, or approximate value. Seems to run fine. Any further information would be truly appreciated. I wish I knew what kind it actually is but, I'll try to describe it. It's around 8 inches tall 5 inches wide. solid green with some flowers and a woman's face(looks almost like a cameo). It has 2 keys and on the face it says Gilbert 1807. On the bottom it has a # 6717B. I'm sure it's the model number or how many were made. I think its a mantel but, could be considered a desk clock. I really don't know,I'm not very savvy in the clock business. My grandmother gave it too me several years ago and I'm beginning to get curious about it. It's missing the glass for it's face but, it still works. I think thats amazing in itself...they don't make them like that anymore! I don't know how to transfer the picture to the pc but, I will have someone help me later. I've never seen one like this before. I love this old clock but, want to know its history. So I can pass this down to my daughter.